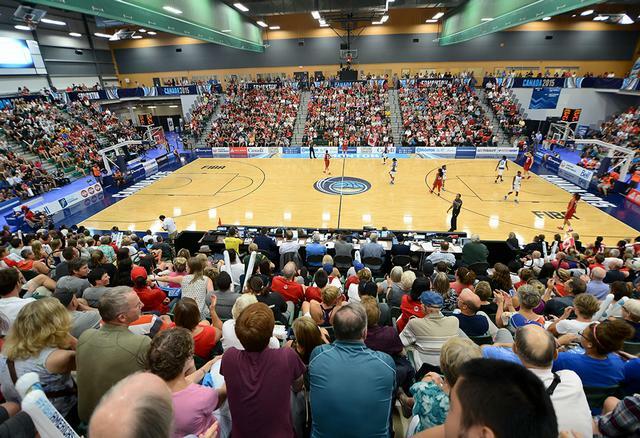 EDMONTON (2015 FIBA Americas Women’s Championship) – With the end of the Group Phase, the Semi-Finals and the 5th place game have been configured. The fifth day of the 2015 FIBA Americas Women’s Championship began with the match-ups to determine who will play for the fifth position of the tournament and the last ticket available for the FIBA Women’s Olympic Qualifying Tournament. First on the court were the teams from Venezuela and Ecuador. Oscar Silva’s team took the lead early and kept it, throughout the game. Ivaney Marques led the offensive for the Venezuelans, accumulating 15 points and 9 rebounds, in the 55 – 48 win. Venezuela will play against Puerto Rico, for the fifth position of the tournament, after the Boricuas won their match against Chile. After evening up during the first two quarters, Puerto Rico imposed a 54 – 33 second half, to take the comfortable win, 92 – 66. The last two games of the day determined the Semi-Final games, with all four teams unbeaten with a 3 – 0 record. In a rematch from the Gold-Medal Match of the 2013 FIBA Americas Women’s Championship, Cuba and Canada did battle to determine the top team of Group A.
Canada established their suffocating defense and well-rounded offensive, taking a 23 point-lead at the end of the first half. Lisa Thomaidis team kept adding to the lead and took the top position of the Group, with the 92 – 43 win. first time since the 1956 South American Women’s Championship. After being down during three quarters, Brazil went to the top of the scoreboard. Argentina quickly responded with a triple from Boquete, and from there Argentina celebrated the historic 73 - 69 win. Argentina finishes in the top of Group A, and confirmed the Semi-Finals for Saturday, when Canada will take on Brazil and Argentina will face Cuba, for spots in the Gold-Medal Match of the 2015 FIBA Americas Women’s Championship. Also on Saturday, Puerto Rico will face Venezuela for the fifth place of the tournament and the last ticket to the FIBA Women’s Olympic Qualifying Tournament.